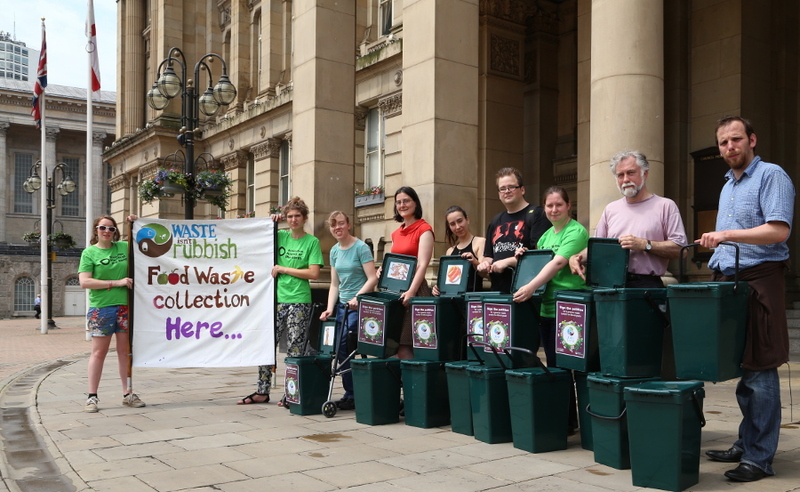 Birmingham residents queued with kitchen caddies to recycle their food waste outside the Council House. Birmingham City Council is consulting on its new waste strategy this year and we hope to push for as green a waste system as possible, which would mean the Tyseley Incinerator is no longer needed. “Waste is a rubbish fuel. We need a waste system that makes best use of the resources in all our waste, instead of letting them go up in smoke in an outdated incinerator. With the Council contract with Veolia up in 2019, now is the perfect time for the Council to rethink its waste strategy. “41% of the residual waste sent to the incinerator is organic matter. By taking food out of the waste stream, and sending the food waste to an anaerobic digester, it becomes a cleaner, renewable energy source. “Seperating out organic matter means we can make better use of all the resources in our waste. This would mean the incinerator is no longer needed, leading to a reduction in CO2 emissions. I agree with your Ideas on recycling and yes a lot more could be done (Some of this very simply at very low cost) however i am aware that in the past 4 years the budget for the refuse collection & Street Cleansing operations has been reduced by 25% so how are you going to pay for this service? The cost of 1 refuse collection vehicle is over £150000.00, the cost of a recycling Wheelie Bin is £20, a small collection “Caddy” is £8. There are 200000 properties in Birmingham and you would require over 30 refuse vehicles to collect this waste, then we can look at the operating costs Labour, Fuel, Maintenance. The Council is looking at its waste strategy at the moment, so they are actively thinking about this. Also the incinerator with Veolia ends in 2019 so again a massive opportunity to do something different at that point. It’s less about trying to make the council do something additional now, but rather changing what they do when there is the opportunity. At the moment the Council Veolia x amount a year to dispose of the city’s waste, mainly through incineration. A lot of what is burnt is actually a valuable resource which the council could sell as opposed to paying for someone to dispose of. Seperating out organic matter, so it is not contaminated means of our waste is a resource. This could generating income which could be used to run the service. Also a lot of the cost is a one-off (ie new caddies or wheelie bins) rather than on ongoing one. Once the two years from the end of the roll-out of the wheelie bins has elapsed (the length of the time the council had to keep weekly bin collections to receive the money for the wheelie bins) they could go to fortnightly collections if enough stuff was being collected in the food waste collection. High cost often supposes having new lorries and an extra collection round, we’d be been keen to see what could be done with the existing infrastructure and collections – see the earlier point about fortnightly collections. Hope this is helpful and useful.